The Thriving Photographer opened in 2012, and I had no idea what it would become. I just wanted to help people. I wanted to show photographers what was possible for them and to give them the steps so they could attract great clients, price appropriately, organize their business, and stop feeling like a faux photographer. I remember the first person outside the US that bought the program. I was so excited, and I was also scared! What if my strategies didn’t work abroad? But then, it did. In Canada, England, New Zealand, Australia, Israel, Oman, and it just kept spreading. Thrivers live in every state of the US and all over Canada. They have become my friends and my tribe. I love them and am so very thankful for each and every one. Today, I want to tell you about one Thrive member in particular. Her name is Tiffany Hines. Tiffany is a single mom who wanted to build her photography business so that she could support her and her son, follow her dreams, and have more time to be the mom she knew she needed to be. Her son, Nate, had come to hate the time she spent on the computer. She joined Thrive and never looked back. Tiffany is what we call an Original Thriver. She’s been around since almost the beginning of Thrive itself. This single mom who after a couple of successful years with the Thrive program followed her next dream and moved from Texas to Michigan - starting her business all over in a whole new state. On top of that... she started homeschooling her son! She’s a real-life supermom. Over the years, Tiffany has been my cheerleader. She sends me little emails to see how I’m doing... Tiffany amazes me, inspires me, and encourages me when I need a pick-me-up. In our private Thrive community, she’s always encouraging and helping fellow Thrivers. Tiffany is the epitome of who and what The Thriving Photographer is. Despite doubts, fears, and having to shoulder the burdens of being the sole provider and the sole parent, she has risen to the occasion and not just survived, Tiffany THRIVES! In honor of Tiffany and with her encouragement, we are doing something B-I-G! We are making it possible for more photographers to start Thriving! The Thriving Photographer is opening up for enrollment today, and we’ve dropped the price! We lowered the investment for The Thriving Photographer because we know what Thrive can do, and we want to get you inside this online training program so that you can see your own life transform. Today can mark the moment when you get to jump in and start living the life you imagine. Are you ready to see what your success story will look like? 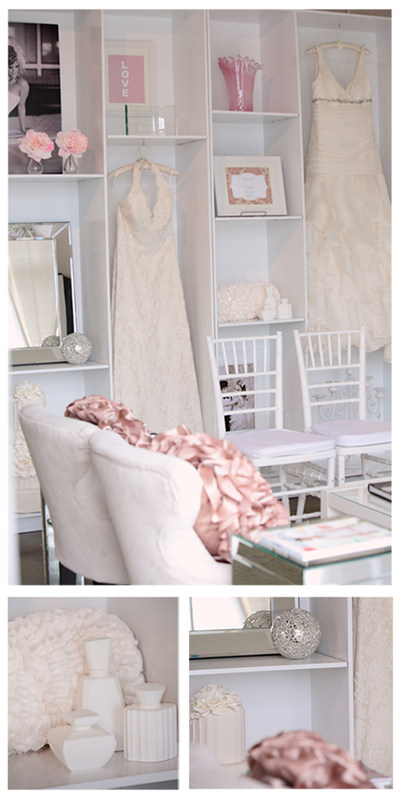 We originally showcased the fabulous studio of Kristin Vining way back in 2011. Since it’s been a few years now, I thought we’d share this drool worthy space again! Can you share a little about your business style? Business style? OCD! ha! Okay, in all seriousness – I am a fast worker. As a mommy of 4 year old twins and operating two companies, I have learned to master my workflow so that everyone stays balanced and happy. My typical approach is – photograph the wedding Saturday, Sunday’s are untouchable – they are dedicated to my husband and twinkies, Monday’s I drink lots of coffee while culling images, marrying my work with my 2nd shooter’s, organizing and processing. On Tuesday’s, my studio manager steps in and starts designing slideshows and storybooks while I begin the blog layout and upload process. By Thursday, the wedding has posted online and the couple are welcomed back from their honeymoon with a sweet little treat waiting in their inbox reading, “Images Ready!”. I try to plan my weekday sessions to happen Wed/Thurs/Friday’s. Of course, on our off-weekends, we’ll shoot any day of the week. Shooting style? Clean. I love crisp, classic and clean imagery. I love soft skin tones and pretty attire. I am in love with pink-buttery, natural light and prefer sunrise shooting to sunset. Will you share a little about the process of designing your studio? I just turned 37 – can I still say, “Super-duper, Fun!”? I purchased our space in Uptown Charlotte the same month that I gave birth to my twinks. I left the walls in its natural cinder block state, but took the two dry walls and had them painted glossy black. 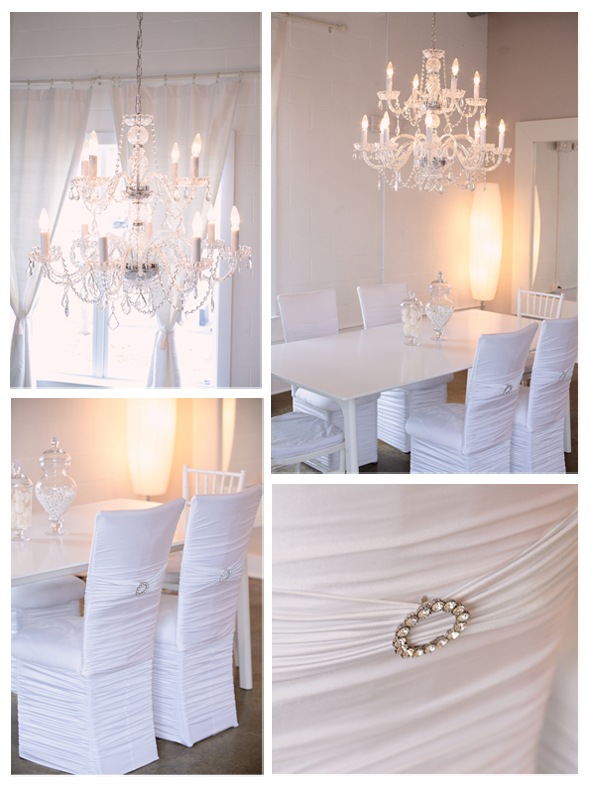 Up until this January it was ‘cool’ space, but I was longing for a “soft, white, clean with a touch of glamour space.” My girls here in the studio are amazing. With the help of Lindsey Regan Thorne, Tiffany Ratliff and Liz Connolly, together we started the process. Lindsey actually has an interior design background so she truly stepped up and started drawing, suggesting and helping me implement what you see now. We all absolutely adore coming into work and we love seeing the looks on our clients faces when seeing the space for the first time. What are the benefits and drawbacks to having a studio? Since the infancy stages of my business, I have always been a proponent of having my own space. I love the professionalism of a quiet, cozy and comfortable studio when meeting a client for the first time. I love that my current clients will always know where to find me. I love that hair and makeup prior to a shoot takes place right here in the studio. I love having all of our favorite work displayed around for people to enjoy. Most of all, I love having all of the girls in the studio at the same time. Amazingly fun times. Drawbacks? Truly – I have never looked at studio space as a drawback. While there is extra overhead, I am still able to keep my pricing competitive with other photographers who are of the same caliber and experience as KVP. What has been your favorite moment as a professional photographer? I don’t think I have one favorite moment as much as I have a handful of favorites. This one in particular definitely stands out in my mind. Shortly after I was back to shooting from having the twinks, I was photographing the mother/son dance at a reception. It was the first time I lost it during a dance. I instantly flash-forwarded 25+ years and envisioned holding my precious, Bray on his wedding day. The mother of the bride was standing right next to me and saw me choked up (I had to keep the camera square in front of my face b/c I was too embarrassed to let it down). She took her arms around me and just started loving on me – it was a pretty profound and touching moment. I still kept pushing the shutter though. A huge thank you to the fabulous Kristin Vining for giving wonderful insights into her photography business and sharing her amazing studio on LeahRemillet.com! When Galicia shared her studio in our private Thriving Photographer group... I knew I had to share it here! While Galicia's studio is obviously fabulous!! There is something that makes me love it even more! How spot on her studio is with her brand! I asked Galacia to share some insights into her studio and her business... Be ready to be inspired! Leah: Will you tell us about the decision to have a studio space? The decision to have a studio space with an office was a no brainer. My in home office was busting at the seams. I always met clients at Starbucks or at a local coffee shop. In addition, after becoming a "Thrive" member, I really felt like I needed to take my business "look and brand" to the next level. Not to mention having the space, but bringing my clients to my studio and office to see what Photography by Galicia is all about, it just adds that professional feel to the experience that I offer. I really feel like my studio space reflects who I am. I owe a huge thank you to my husband, who is my number one fan and for letting me do what I LOVE. And to Keri Meraz, my make up artist and friend, for helping me design a space that is AMAZING! Leah: What's your favorite part of your studio and why? Leah: Best investment you've made for your photography business? The best investment I have ever made for my photography business is a hard one to answer. There are so many things I did that has helped me in one way or another. I am really blessed that all the things I have invested so far has been worth it ten times over. The first thing I invested in was the Crave Mentoring class. It helped me figure out my editing style. I also purchased and upgraded some of my gear. But lastly I invested in Thrive. Thrive has been amazing! I have met some amazing photographers and I am so proud to call them my friends. It has also helped me organize my business. It has given me confidence and at the same time created some huge goals that I want to accomplish as a photographer that I otherwise never thought I could. I admit it has been a lot of work, but I am seeing the rewards. For only being in business less than a year, I am blessed. Hard work pays off. Leah: You know I love your brand, will you tell us a little about how you found the inspiration for it? I hired the amazing and talented Lindsay Stoyan, who is local. She asked me what kind of person I was and I described myself as outgoing, bold and modern. And she hit it spot on. The flower is full of color and it's not traditional but spunky looking. Leah: Favorite song-set when you're working? My favorite song-set when I am working is Pandora pre-set radio stations. I love that I can input a song that I currently like and Pandora will play songs from that genre. My favorite is the Tongue Tied Radio Station. Try it! It's alternative, spunky and upbeat. Keeps me motivated! Oh my gosh! I am so excited to finally get our Thrive Retreat London Recap up for you! Note to self – never, never, never forget to check that the house you’re renting for holiday for a month has internet! Ireland was amazing, but we were a little more unplugged than we were hoping for! Okay. So there are dreams that you put out there, that you whisper to the universe, but at the time, you can’t possibly imagine could ever come true. This year has been one such whisper (traveling the world for a year) and having the opportunity to bring The Thrive Mastermind Retreat for Photographers to England was an over-the-top, pinch me because I can’t believe this is real moment. I remember when I first dreamed of having a Thrive Mastermind Retreat. I remember opening registration for the very first one (it was in Florida) with a mixture of emotions… partly terrified but mostly exhilarated. This Thrive Mastermind Retreat was number SEVEN, but it was the first one outside of the United States, so once again, I found myself with that mixture of emotions… partly terrified but mostly exhilarated. When the day finally arrived and these amazing women would soon be knocking on the door, all I could feel was giddiness! But let’s start with the house! It was incredible! Every retreat is hosted in an absolutely stunning venue, but this one takes the cake! These retreats are about growth, and well, I believe growth feels better when you’re being pampered and made to feel like a queen! I’ll show you more behind the scenes of the house and the accommodations in a minute, but first I want to share Night One. We always start by letting everyone get settled, and then we all come together to fill our bellies with delicious foods and get to know each other. I always feel like I’m holding in a secret because at this early moment, everyone is a little shy and a little uncertain, but I know that before their heads hit their pillows on this first night, they will have made fast friends. Friends that all become cherished gifts for years to come after we all say goodbye at the end of the retreat. For Night One, everyone received a gorgeous hand calligraphied name tag by Heather at Design Roots. Her prints, note pads, and calligraphy supplies are fabulous! Heather doesn’t stop spoiling our attendees here. They also receive a gorgeous print from her and a second name card for our celebration dinner. Now it’s time for our first training session! I love this night as I get to tell my own personal story and journey with way more detail than I would online. We set the foundation for their growth strategy and just get empowered and excited for everything that’s about to come. It’s always a really good idea to leave extra room in your suitcase when you come to a Thrive Mastermind, because I’m going to fill it with gifts and surprises that I have planned throughout the retreat! Our first gift came complete with a notepad from Clean Mama (our favorite blog for simplified home care and cleaning tips! ), an adorable camera USB keychain from Photo Flash Drive, ‘Make it Happen’ pencils to keep note taking motivational by Wangs Wonderful World, and a couple other fun gifts from me including a gold dipped pencil pouch to keep these first gifts all tucked away safe. Of course we can’t forget our signature Thrive Mastermind Workbooks printed by the ever fabulous Pro Digital Photos! Every time I open the box to see our newest Mastermind Design (we change it for every retreat)… I’m over the moon with the print color and quality! Okay! I promised to show more of the house! It was amazing! I’m pretty sure I already said that… but just look at it! I could say it 10 more times and still not do it justice. I think this may be my favorite house we’ve ever stayed in, and that’s really saying something because our New Orleans plantation house was amazing!! You better believe we were out on the deck in the hot tub every night, and the pool got plenty of love too! There were never-ending spots to curl up and relax in, or go and explore. This side sitting area has now become my next backyard goal (that fireplace!! ), and that’s despite loving our own last backyard makeover. For one of our meals, I brought the girls to possibly the coolest location ever for a lunch… a long boat on the canal! The Thrive Business program is based on what I call the experience business model. I believe in creating an incredible experience for our clients while building a business that works for the life you are dreaming of (instead of having a business that seems to be at odds with the personal life you want). We focus on creating such an incredible experience that comparison and competition fade away, clients can’t help but gush, and creatives are able to build an incredibly successful and profitable business! All because they have set themselves up as the premiere experience. So of course… with experience being the cornerstone of my business philosophy – we work to surprise and delight our Thrive Mastermind attendees every step of the way! And we could never pamper and shower our amazing attendees with gifts as we do without the amazing contributions of incredible businesses and fellow entrepreneurs! Here’s just some of the amazing that was sent to our attendees! Divina Cosmetics – This is an Etsy shop, how cool is that!? Monica (the owner) creates small-batch organic natural cosmetics and skin care products out of England! How adorable are these tees (did you see the very top image on this post? Swoon! ), and how amazing does Leah Remillét International team member, Ashley look in the ‘Get it Girl’ tee by Aleah Shop?!? Ash and I had laughed hysterically in between shots as we played models in these adorable tees with the retreat house as our backdrop before all our attendees arrived. There are so many gifts – I am so lucky to work with so many amazing businesses and creatives! Tangerine Lip Balm – Little Flower Soap Co.
*The rest are special surprises from me. Okay… Let’s talk about food again! 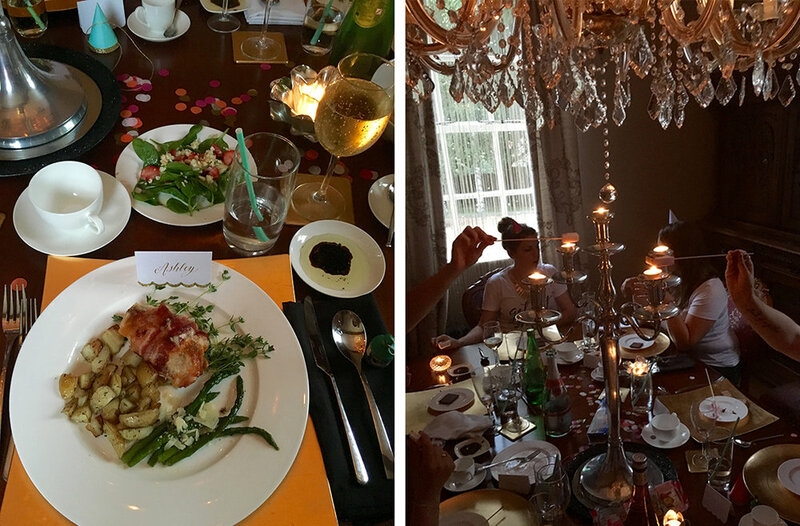 This time with our London retreat experience, we enjoyed one of our dinners in and one out. Our dinner in was definitely my favorite! We even roasted marshmallows over candles to share a very American treat (s’mores) with everyone! And how gorgeous are the name tags that Design Roots sent for us?!? Then there is our model afternoon! We bring in different models and have an opportunity to shoot together, learning from each other, and building new contact for blogs, social media, and portfolios. The teaching continues throughout our 4 days together. We cover marketing, sales, organization and workflow, and so much more. And since food is my happy place (yes we are back to food again), there is no shortage of delicious snacks, meals, and treats (this is not the place to come on a diet!). How much fun are these utensils from Jamboree Party Box? They can’t help but make lunch more fun! Did I mention that the utensils are dipped in gold glitter! Working with these women who made the trip from Denmark, Germany, the U.S. and all over England and brought their love for photography and their ambition to thrive in their businesses will always be one of the magical moments in my highlight reel when I look back at the history of Leah Remillét International. I know I say it all the time, but I love what I do! I don’t even have words to express how grateful I am. I know exactly how lucky I am to do what I do. I know exactly how magical it feels, and I am grateful every single day for the opportunity I have been given to change the lives of creative women all over the globe. If you want to see more behind the scenes from a totally different perspective, check out Emma’s of Studio Bambino recap that she wrote on her blog. This is our next installment of The HER WAY Series, featuring the very different but each wildly successful for her personal goals, photography businesses of incredible women. Today, I'm sharing our 3rd Success Story, this time featuring Jess Newman. A single mom who took a huge leap, leaving her corporate job and building a thriving photography business that is supporting her family, bringing in $10K a month AND the best part... Jess gets to be involved in her kid's schools, meet them for lunch and be the mom she dreamed of being. Welcome to the third installment of 'She did it HER way' If you missed Katie's story - it's amazing! Today, I'm excited to share Brooke's story with you. Brooke was already doing great things in her photography business including reaching that big 6-figure mark. What she didn't have was balance. Brooke was running in all directions at all times. Feeling exhausted, guilty and overwhelmed - she needed a solution. Enter - The Thriving Photographer™. For me, there is a difference between success and thriving. Success is something people see from the outside. Maybe it's a great title, a large home, a fun car. Success is the outward appearance of achievement. Thriving, on the other hand, is more so an inward feeling. It is accomplishing goals for the lifestyle you want and feeling good about life through the process. That's why Thrive was named, 'The Thriving Photographer.' To me thriving means that YOU set the terms for your success. If it had been called 'the successful photographer', someone else might be setting the terms for you and that's not why any of us take on starting our own business. One of my favorite things about my Thrivers (as I affectionately refer to our members) is that their goals and dreams are as different as their photography styles and specialties. I am so excited to share with you, my interview with you Amanda Holloway! We are talking all about how she built a high-end Senior brand and business and she's giving us a tour of her amazing studio! You do NOT want to miss this one! But first, if you'll indulge me, I'll tell you the story of how we met. We were at WPPI - actually, Kelli France and I were walking through the trade show floor and saw Amanda speaking for ProDPI. We'd never met, but through mutual friends found out we both wanted to be introduced to one another (hmm, this is sounding weirdly like an engagement story!). Kelli and I stopped to listen to Amanda speak and all of a sudden she looks up, spots us and stops her whole presentation and says, "Hi Leah! Hi Kelli!" It was everything I could do not to shout, 'Amanda Holloway just said hi to me!" Well, after she finished her presentation the three of us went to lunch to get properly acquainted. That lunch turned into a big ol' cry fest but we'll tell you about that in the video! How she built her luxe senior photography brand. How she's identified and attracted her dream senior clients. Amanda gives us a tour of her AMAZING STUDIO!! It's going to be an awesome Video Friday! When I first started my journey as a photographer... I was new. Well that's not obvious is it?! But I was also new in the sense of what I saw when I was culling through images at the end of each session. I was looking for the exposure to be right, their eyes not to be shut and, well, my clients not to be blurry. If I had those, I was doing pretty good! As time passed, my photography evolved - more than anything else, experience was teaching me the lessons that I had been trying to learn in theory for way to long. Theory is just that, theory until it's tested... it's true in science, it's true in those crime shows I watch and it's true in photography. More and more I began to understand lighting and posing and framing. With each new session under my belt, I gained a better understanding of how to bring it all together. But the final element of my photography was recognizing and capturing expression. I'm not alone on this. For many, it seems that the last piece to fall into place is expression. Today, I consider expression to be the most important element in any photograph that I capture (with the understanding that it's exposed and lit properly). I'm constantly looking for how to bring out more expression and more personality from my clients. ... They all come second to expression. Every time an image really grabs me, it's because I can feel the emotion. Test the theory... the next time you're blog hopping over to one of your favorite photographer's sites, really pay attention to the expression. If you can't feel the emotion, then the photograph is missing its heart beat. Emotion doesn't have to be all smiles either. It can be sadness, contemplation, frustration, anger, silliness, sadness, joy and a million other feelings in-between. But emotion must be there. If you're wondering what you can do to bring your photgoraphy up a notch, go through your portfolio and judge it based only by expression. Remove all the images that don't quite have "it" and replace them with your best work that really captures the heart beat of your clients! What do you think? Does expression play that large of a roll?